Every writer knows that a good query letter is crucial in getting a manuscript read by an agent, which is the first step in getting an offer for representation. This is the query I sent for MIDORI BY MOONLIGHT. This letter elicited a lot of requests from agents for the full manuscript and eventually I did sign with an agent who ended up getting me a two-book deal with St. Martin’s. In brackets are my explanatory comments of why I constructed it the way I did. I am currently seeking representation for Midori By Moonlight, a novel starring the Japanese Bridget Jones. Thirty-year-old Midori Saito’s dreams are all about to come true. A strong independent streak has always made her feel like a stranger in a strange land in her native Japan, but now she’s embarking on a new life in San Francisco. She’s about to marry Kevin, the perfect American man—six feet tall, with curly hair the color of marmalade. Unlike a Japanese guy who’d demand she be a housewife, Kevin doesn’t mind if Midori follows her dream of becoming a master pastry chef. Her life is turning out as exquisitely as a Caramelized Apple Tart with Crème Fraiche, until Kevin dumps her at their engagement party in favor of his blonde, ex-fiancée, whom Midori never even knew existed. Now Midori is not only on her own—with just a smattering of fractured English in her repertoire—she’s entered the U.S. on a fiancée visa that will expire in sixty days. Unable to face the humiliation of telling her parents she’s been dumped, and not wanting to give up on her American dream, Midori realizes she’s “up the creek without a saddle.” Her only hope is new acquaintance Shinji, 30, who long ago escaped Japan after a family tragedy, is a successful San Francisco graphic artist and amateur moon gazer, and who lets her share his apartment as a platonic roommate. Soon Midori finds herself working at an under-the-table hostess job at an unsavory Japanese karaoke bar, making (and eating) way too many desserts, meeting a charming and handsome chef with his own restaurant who may be too good to be true, and trying to uncover the secret behind a mysterious bar hostess who looks strangely familiar. 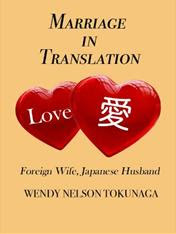 But Midori’s willing to endure almost anything to hang on to her American dream, and she just might find that the love she’s been searching for far and wide is a whole lot closer than she thinks. I am the author of two children’s non-fiction books published by KidHaven Press (Famous People: Christina Aguilera and Wonders of the World: Niagara Falls), have had short stories published in several literary journals, and currently work as a freelance writer and editor. I attended the Squaw Valley Writers' Conference in 2001 and 2002, and my self-published novel, No Kidding was a winner in the Writer's Digest 2002 Best Self-Published Book Awards in the Mainstream/Literary Fiction category. I am Caucasian-American—my Japanese last name comes by way of my husband who was born and raised in Osaka. I have lived in Japan and traveled there many times, the first time as a winner in a songwriting contest sponsored by Japan Victor Records. I also speak conversational Japanese and have placed in a number of Japanese singing contests and performed on TV in Japan. Thanks, Wendy, for posting this. It's such a huge help for those of us just embarking into query hell. I liked how your voice really came through-it certainly gives me a hint of how the novel would read (it sounds so funny. :) ) Just a ques-were you ever concerned over its length? Very cool Wendy! Welcome to the wonderful (?) and whacky (!) world of Blogging! Kelley, Thanks for your comment. Yes, I knew it was a bit long, but since I felt it would engage the reader and that all the info was relevant I didn't worry about the length, though I know the "rule" is one page. Wendy this is great! And the editorial comments perfect. ;-) Definitely gives a sense for the hows and whys. No wonder you got picked up by an agent quickly! What a great query letter! And I love how you inserted your reasons for shaping the letter the way you did. I love your new blog and the query letter. I can't wait to read your book. This really is useful, Wendy. Writers hoping to be published need to see a well-written query letter, and it is helpful to be taken through the nuts-and-bolts construction of that letter and hear why certain elements work and others don't. Thanks, Mary! Great to see you here.